Trestle table, bespoke handmade from solid oak and based on a medieval dining table design. Shown here in our Chalvington Old Flaxen colour, we actually use this one as our showroom desk, so it's had to put up with the rigours of daily use! Available in a number of standard lengths and, being bespoke, we can fine tune sizes to fit in with your specific requirements. Base dismantles for easier access though awkward places. You can see this table, together with a set of our upholstered oak side chairs, here in the kitchen of our clients wonderful C16th timber framed home. Click: Oak trestle table and upholstered chairs in historic house and another view here: Upholstered chairs & trestle table in oak framed kitchen. 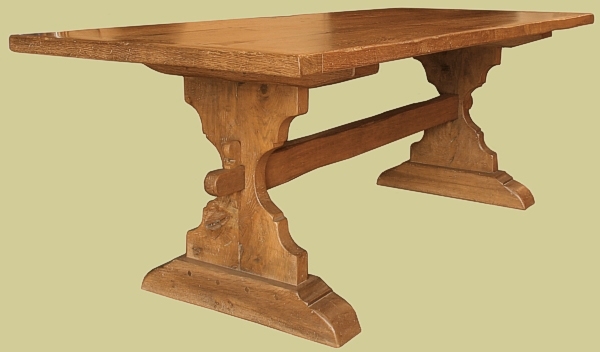 To see this table in the beautiful beamed room of our clients French chateaux, click Medieval style table & boarded oak settle in French property and also: Medieval style oak trestle table in old French property. Remember, this particular table is bespoke, so we can make it to your own dimensions. For essential reading on this subject, please see: A Guide to Choosing the Ideal Dining Table Width and What is the ideal Dining Table and Chair Height? You can also read another interesting article here: A Study of Period Dining Tables - Height and Width. You can specify special widths and lengths anywhere between the size bands, at no extra charge. For height changes please contact us first.